Twenty-one churches in Egypt’s southern rural Minya governorate can restore, expand and rebuild their churches after receiving approval from the Minya Governor. Governor Essam al-Bedeiwi approved the 21 applications over the last six months. Some of the churches had been waiting for more than 20 years for a permit to come through. 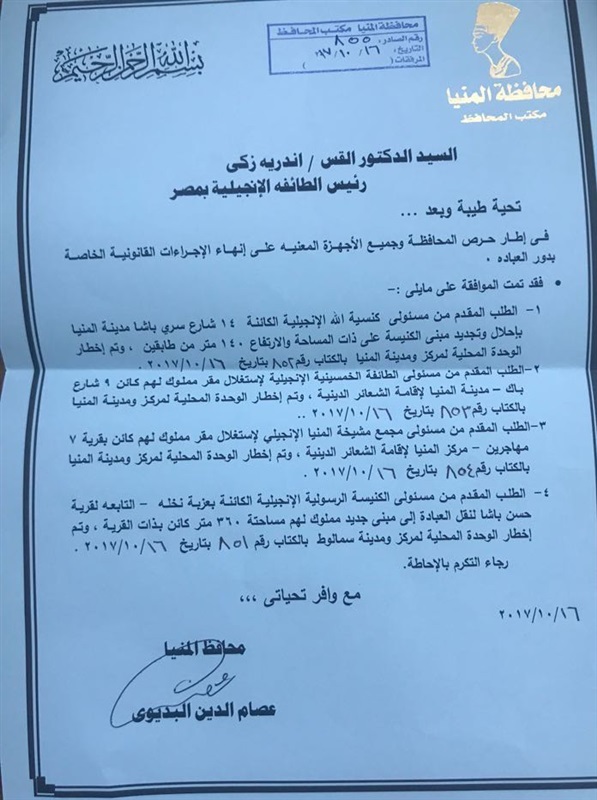 On 17 November an evangelical church in Tama, Sohag governorate, also received permission to renovate its building. Some analysts note that the approvals have preceded several visits by international evangelical delegations to Cairo. Last week, leaders from evangelical churches around the world met Egypt’s President Abdel Fattah el-Sisi in Cairo, as part of the celebrations marking 500 years since the Reformation. This followed a visit in early November by a delegation of Christian evangelicals from the US to meet evangelical leaders in Egypt. US Vice President Mike Pence is also scheduled to go to Cairo in late December. A local source told World Watch Monitor that Egypt’s President is keen to “show the US that Egypt is standing with the Christians and that there is no persecution in Minya governorate”. Meanwhile the Coptic community in Minya has seen many of its churches forcibly closed or set on fire. Some of them have been reopened but others are still waiting for a permit. As World Watch Monitor reported last year, it is almost impossible for Christians to obtain a license to build a church in Egypt. But last year, Egypt’s parliament approved a law relating to the building and renovating of churches, and in October a cabinet committee met to start work on the legalisation of unlicensed churches. Meanwhile Coptic churches around the country rang their bells at noon on Saturday (25 November) in solidarity with the victims of Friday’s attack on the al-Rawda Mosque in North Sinai. The attack killed at least 309 people and injured 128. In a statement, the Church “offered its sincere condolences” to the bereaved families, adding that its members were “praying for a speedy recovery of the wounded”, the Egypt Independent reported. A local IS affiliate known as Sinai Province has attempted to impose its hardline interpretation of Islam on Egypt’s North Sinai population around El-Arish, Sinai’s largest city and approximately 80km east of Bir al-Abed, where the attack took place. Hundreds of Christians fled the area and re-located to Port Said in late February and March, after Islamists posted videos and leaflets telling Copts to leave the area or be killed. 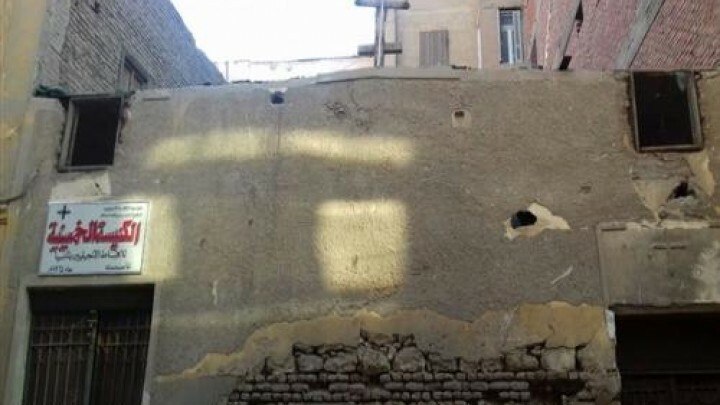 In October, an attack on a Coptic Church in El-Arish was repelled by state security forces stationed outside the building. World Watch Monitor has reported how IS is also trying to establish a foothold in Upper Egypt, an area “marginalised” by politicians, lacking in security and in which many people are poor and uneducated. On Ascension Day (26 May) a bus attack killed 29 Copts travelling to a monastery in Minya. This isn’t the first time controversy has been sown by the comments of a talk-show host. In June, the powerful Islamic cleric Sheikh Salem Abdul Jalil appeared in court on charges of making anti-Christian comments on his TV show, causing the TV channel to end its contract with him and send an apology to all “Christian brothers”. It came at the same time as the submission of a bill to the Egyptian government scholars at Cairo’s Al-Azhar University, the pre-eminent seat of Sunni Islamic learning, which “aims to reaffirm the total incompatibility between the violence justified by religious arguments and Islamic law”.